Congratulations to everyone who chose that it would NOT snow at the North Pole on Christmas. 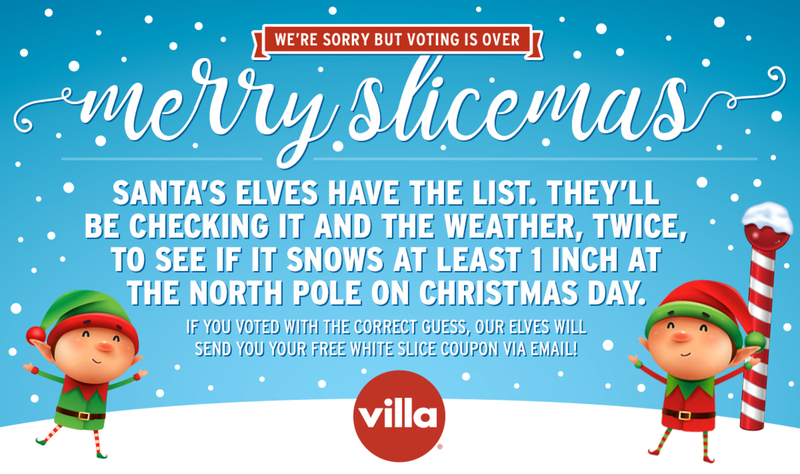 Winners were emailed their coupon for a Free Slice of Neapolitan Three Cheese "White Pizza". No Purchase Necessary. This promotion runs from 9:00amEST December 11, 2017 – 11:59pmEST December 26, 2017. To be eligible you must be a legal resident of the US, 18 years of age or older, you must sign up for the Villa Italian Kitchen eClub at www.whiteslicemas.com; and guess if it will snow at least 1” at the North Pole, Nunavut (otherwise known as Alert, Nunavut) on December 25, 2017/Christmas Day, between 12:01amEST and 8:00pmEST. Your vote must be cast by 11:59pm on December 21, 2017. Alert, Nunavut by www.theweathernetwork.com. This promotion shall be governed by the laws of NJ. Void where prohibited.